Exterior of the NFL draft tent. Police barricades are in place along the Benjamin Franklin Parkway – through the NFL draft and beyond. Detours are up on Kelly Drive and Martin Luther King Jr. Drive in the area of the Philadelphia Art Museum. Other roads are closed, too. (See full list below.) Visitors are urged to use public transportation to the event. Free parking will be available at the sports complex where people can hop on the Broad Street Line at AT&T Station. • The westbound center roadway of the Benjamin Franklin Parkway is two lanes from 20th Street to Eakins Oval. The left lane of Benjamin Franklin Parkway is closed from East Eakins Oval to Spring Garden Street and to southbound Kelly Drive, where it will open up to three travel lanes. • Right two lanes of Eakins Oval in front of the steps to the Philadelphia Museum of Art are closed. • Southbound Kelly Drive has a lane drop between 25th Street and Benjamin Franklin Parkway. • Inner lanes of the Benjamin Franklin Parkway to close from Eakins Oval to 20th Street. • Benjamin Franklin Parkway will be closed from 20th Street to the Art Museum. • Martin Luther King Drive will remain open to 24th Street. • Eastbound Spring Garden Street will remain open from 31st Street to 24th Street. • Kelly Drive will be closed at Fairmount Avenue with traffic detoured onto Fairmount Avenue and Pennsylvania Avenue. • Traffic headed inbound from Spring Garden Street Bridge or Martin Luther King Drive will have to exit Eakins Oval on the 24th Street ramp. • Traffic headed inbound on Kelly Drive will have to exit Kelly Drive at Fairmount Avenue. Note: The following roads will be accessible to local residents. NOTE: Bike lane and pedestrian detours are also posted in the area. For enlarged version of the graphic, click here (pdf). Main event tickets: The lottery for spots in the open-air theater constructed on the Art Museum steps for the live draft has ended, and VIP ticket packages to get into the main event are sold out. Test your football skills: How does your athletic prowess measure up to the NFL’s top prospects. Do the vertical jump, 40-yard-dash, obstacle course, field goal kicking and passing accuracy drill, just like the top college players do each year at the NFL Combine. Games for kids: Similar to the other games, but specifically designed for the little ones. Kids can test their passing, snapping and kicking skills. There will be flag football clinics hosted by USA Football coaches for kids ages 6-17, an obstacle course and a digital game day experience. Photos: Take photos with oversized helmets or step inside body-cast molds dressed in the uniforms of your favorite team. You can also snag a picture with the Vince Lombardi Trophy and player-sized mannequins of this year’s top draft prospects. 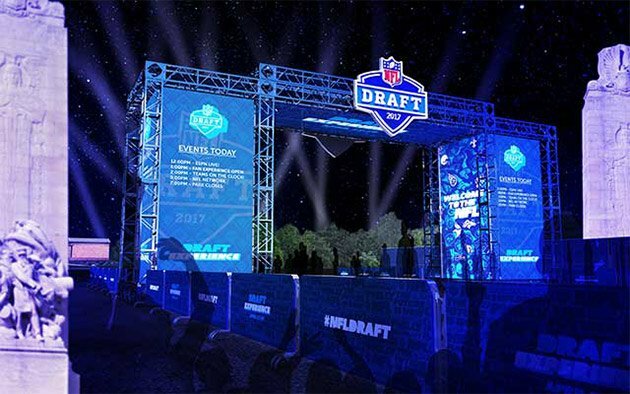 Live the NFL life: Explore replicas of AFC and NFC locker rooms, experience NFL games with virtual reality and even visit the NFL draft set where Roger Goodell will announce the names of the picks behind the podium. Autographs: There will be an autograph stage with current and former NFL players. The schedule and players have yet to be announced. Get stuff: There will be plenty of opportunities to buy NFL gear, and snag free stuff. An NFL shop will be set up to selling draft merchandise, including customizable jerseys and the official 2017 NFL draft hat. An auction also will take place that will include giveaways and instant prizes. Live TV and music: ESPN’s SportsCenter and the NFL Network will broadcast live from the Benjamin Franklin Parkway during the draft. There will be a music stage featuring mascots, cheerleaders, team drumlines, and local musical talent. Fly over the draft: A 100-yard zip line will soar above the Draft Experience. This is anticipated to be a popular attraction, so there will be limited availability. It’s first-come, first-serve to ride the zip line. For a full list of the free draft activities, click here. There are also plenty of coffee shops, restaurants and bars to grab food and drinks near the Benjamin Franklin Parkway. A list of PhillyVoice's recommended options can be found here. 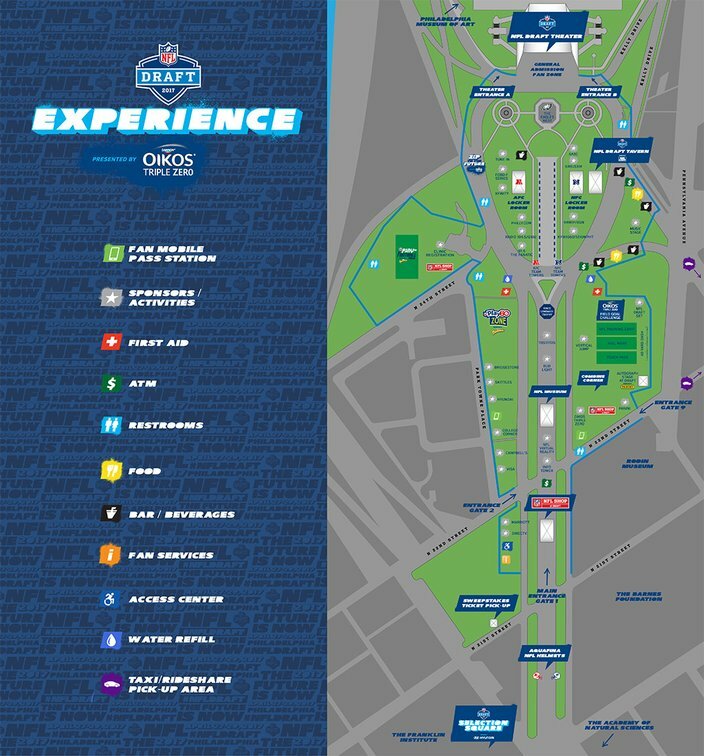 The NFL Draft Experience scene along the Parkway is pictured in this illustration provided by the NFL. Security measures will not be as stringent as they were during recent events, like the papal visit or the Democratic National Convention, which required the installation of security barriers per the U.S. Secret Service. But expect security to be tight, not unlike at sporting events held at the stadium complex. The NFL has hired multiple private security companies to work directly with Philadelphia police and other public safety officials, city spokeswoman Ajeenah Amir said. Attendees will be required to pass through magnetometers at the main gates on Benjamin Franklin Parkway at 21st and 22nd streets. All bags and items are subject to physical inspection by security personnel. Bags, purses and backpacks cannot be larger than 16 inches by 14 inches by 12 inches. • No outside food or beverages will be permitted. Bottles, cans, liquid containers and coolers are prohibited unless a person has medical or dietary needs. • No video recorders, selfie sticks, artificial noisemakers or objects that would obstruct another fan’s view, including umbrellas with diameters great than four feet. Drones, laser pointers, folding chairs, bikes and other large personal objects also are forbidden. • Fans may not smoke within the NFL draft area and are not permitted to carry lighters or e-cigarettes. • All weapons, including firearms, pepper spray and electronic stunning devices, and missile-like objects are prohibited. • Only service animals are allowed entry. Any item deemed dangerous or inappropriate will not be permitted inside. All confiscated belongings will not be returned. 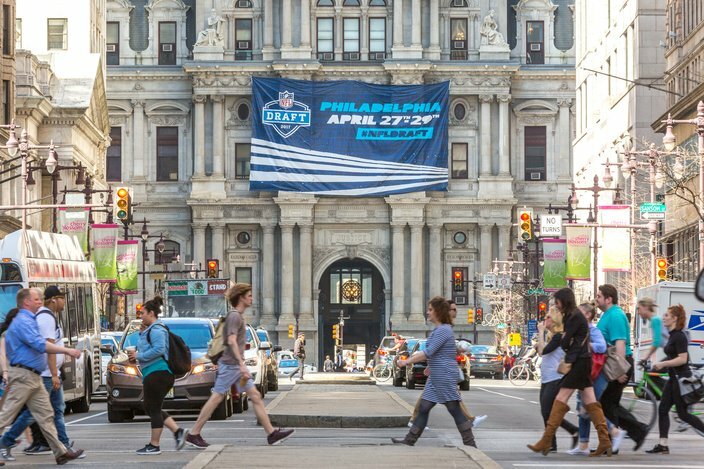 An 2017 NFL draft banner hangs from the 15th Street side of Philadelphia CIty Hall. The three-day event will take place at Eakins Oval on the Benjamin Franklin Parkway from April 27-29. SEPTA has outlined the most practical routes, depending on where you’re coming from, to get to the NFL draft festivities on the parkway. Visitors are staying along Broad Street for the event can take SEPTA’s Broad Street Line to either the City Hall Station (where riders can transfer for free onto the Market-Frankford Line) or Race/Vine Station. From those stations, visitors can walk to the beginning of the Benjamin Franklin Parkway where the draft attractions are located. Extra trains will run the day of the draft to accommodate more riders. Free parking will be available at the lots for Citizens Bank Park and the Wells Fargo Center – both convenient to the south end of the Broad Street Line – beginning Thursday, April 27 at 3 p.m. Visitors coming from West Philly, Old City or the city’s northeast corridor can take the Market-Frankford Line — known locally as the El — to either City Hall Station or the 15th Street Station. Extra trains will run the day of the draft to accommodate more riders. Free parking will be available at the Festival Pier lot at Columbus Boulevard and Spring Garden Street starting on Wednesday, April 26, for park and ride travelers. Trolleys from several areas of the city will transport football fans to the Ben Franklin Parkway (see map above). Specifically, the following routes can be used to get to the NFL draft activities by getting off at the 19th and 22nd street stations: 10, 11, 13, 15, 34 and 36. Coming from Delaware County or Montgomery County? Take the Norristown High Speed Line to the 69th Street Transportation Center and transfer to the Market-Frankford Line. Take that to 15th Street or City Hall, and its a manageable walk to the draft activites from there. SEPTA’s Regional Rail lines offer transportation into Center City from several suburbs and areas outside the city. Note that Regional Rail lines do not accept SEPTA Key Cards. Fares vary depending on where you’re coming from. More info on fares can be found by scrolling below. No matter which Regional Rail line you’re taking, you’ll want to get off at Suburban Station, which is right next to the beginning of the Parkway. Regional Rail lines will be operating with additional trains during non-peak hours to accommodate more riders during the draft, as well as the Penn Relays. For a map of Regional Rail lines, click here. For Regional Rail schedules, click here. SEPTA recently rolled out the Key Card, which works like a debit card and can be used to pay the fare to board Broad Street Line, Market-Frankford Line, Norristown High Speed Line, trolleys and buses. Key Card kiosks are open at all Broad Street Line and Market-Frankford Line stations, as well as at all SEPTA sales offices. A minimum $10 must be loaded onto the card. Fares also can be paid in cash or by purchasing tokens. Note that sometimes SEPTA kiosks won’t have change, so carrying exact change for your trip is advisable. SEPTA token machines are featured at many (but not all) subway stations, although those machines only accept cash. One way fares on the Broad Street Line, Market-Frankford Line, Norristown High Speed Line, trolleys and buses, cost $2.25. Transfers are $1. Regional Rail tickets can be purchased at kiosks located at some stations. Fares also can be paid in cash after boarding the train. • One-Day Convenience Pass — $8 — Valid for 8 trips on buses, subways and trolleys in one day by one person. Not valid on Regional Rail lines. • Family Independence Pass – $29 – Same perks as the Independence Pass for up to 5 people traveling together, with at least one but not more than two individuals 18 years or older. • Ridership during the days of the NFL draft is obviously expected to be higher than normal. The Broad Street Line, the El, Regional Rail lines and several trolley routes will operate with additional trains and trolleys on Thursday and Friday, but expect a more crowded commute either way. • The following bus routes will be detoured around the parkway for the draft: 7, 32, 33, 38, 43 and 48. The detours on routes 27, 38 and 43 began April 10. Those detours can be found on SEPTA’s system status website. • Much like Pope Francis’ trip to the city in 2015, there will likely be a lot of out-of-towners here using SEPTA for the first time. Be prepared to be patient. 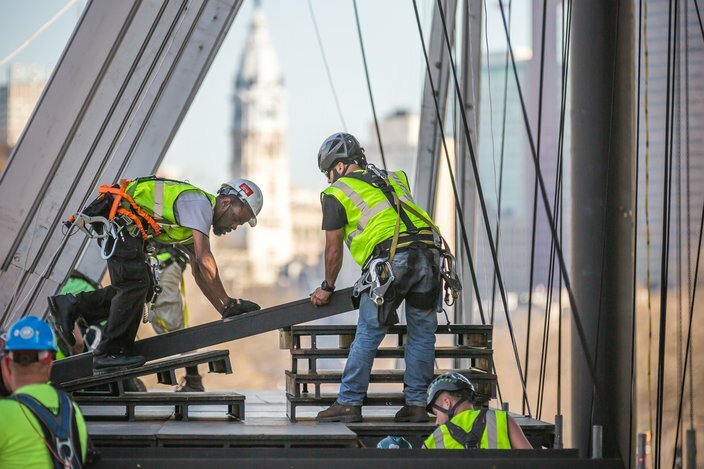 Workers assemble the stage atop the steps of the Philadelphia Museum of Art. This will be the setting for the 2017 NFL draft on Friday, April 28 and Saturday, April 29. Several museums and other cultural attractions along the Benjamin Franklin Parkway are offering special deals to coax football fans to come through their doors. 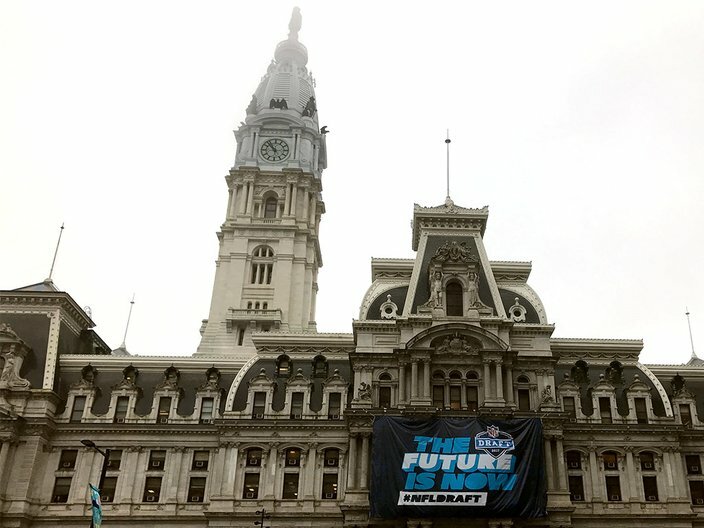 The Franklin Institute will host the NFL draft’s Selection Square, where team tables and player selection meetings will take place. Museum attendees can observe the meetings from a small viewing gallery. Any adult wearing NFL team gear will receive $2 off admission. Museum patrons will need to enter the Franklin Institute from the 20th Street entrance and pass through metal detectors. The Academy of Natural Sciences will offer free general admission — regularly $17.95 for adults on weekdays — during the NFL draft. Anyone wearing an NFL jersey will receive a $1 discount on a Super Saver Ticket to the museum’s two special exhibits, Butterflies! and Frogs: A Chorus of Colors. The Parkway Central branch of the Free Library of Philadelphia is inviting football fans inside for free guided tours of the historic building. The Barnes Foundation, Eastern State Penitentiary, Rodin Museum and the Philadelphia Museum of Art all will operate on regular schedules. Visitors to the Art Museum will be disappointed to find the Rocky Steps closed, preventing tourists from re-enacting the Philadelphia boxer's famous pose. The Rocky statue at the bottom of the steps will be accessible, however. An estimated 200,000 people are expected to attend the three-day event. To place that in perspective, the average daily attendance projects to be similar to the Made In America Festival concert, which draws about 65,000 people to the same area of the city each September. 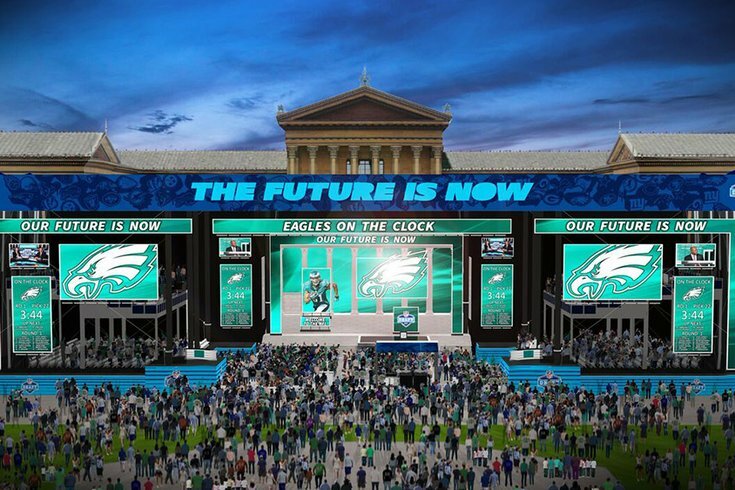 The NFL draft and the NFL Draft Experience will bring fewer visitors than the papal visit, which saw hundreds of thousands of people gather on the Benjamin Franklin Parkway at once for the papal Mass. Major events carry the possibility of unpermitted protests, given the large crowds and media attention they attract. Thursday: Patchy fog between 7 and 8 a.m. Otherwise, partly sunny, with a high near 79. Calm wind becoming south 5 to 9 mph in the morning. Thursday night: A chance of showers and thunderstorms. Mostly cloudy, with a low around 61. South wind 6 to 9 mph. Chance of precipitation is 30 percent. New rainfall amounts of less than a tenth of an inch, except higher amounts possible in thunderstorms. Friday: A slight chance of showers and thunderstorms before 11am. Mostly sunny, with a high near 82. West wind 6 to 8 mph. Chance of precipitation is 20 percent. Friday night: A slight chance of showers. Partly cloudy, with a low around 63. South wind around 8 mph. Chance of precipitation is 20 percent. Saturday:A slight chance of showers and thunderstorms. Partly sunny, with a high near 84. Chance of precipitation is 20 percent.